A stunning hooped ceiling pendant light in chrome and crystal glass that would make a fantastic feature light for a hallway or landing. This is the smallest diameter pendant in the Eternity range and is available in two heights - the one illustrated here has the shortest drop. 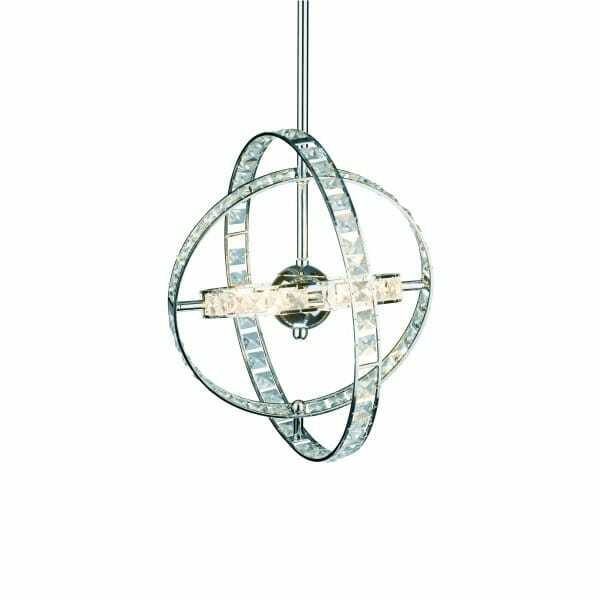 Based on a gyroscope design, this modern pendant light has rotating polished chrome hoops with faceted crystal decorations inside the hoops. The inner hoop contains the 6 halogen capsule bulbs which give this light a real sparkly effect. The pendant if fixed to the ceiling on a dome shaped polished chrome rose and suspended on a chrome rod. The frame has a circular chrome centre around which the circular hoops are arranged.